At long last we were able to track down some decent wild salmon, and I took advantage of our returning wintry (cold, windy, rainy) weather to make a meal I’ve had my eye on for some time: salmon with lentils and bacon. An unusual combination, to be sure, but it really sounded like it could work. My only adjustment to the recipe was the method I used to cook the salmon: rather than pan-searing it and finishing it off in the oven, I simply roasted it skin-side up at 450F until it flaked. I’ve cooked much of my salmon in this fashion since trying a broiled miso-citrus salmon dish from my Simply Ming cookbook, although I save myself the aggravation of attempting to use my oven’s faulty broiler anymore. The skin protects the fish and keeps everything nice and moist, and since my husband and I don’t eat the skin, we like the fact that it peels off easily when served. So the salmon tasted great, and hit the spot since I’ve been wanting some for what seemed like weeks. The lentils were simmered with bacon and garlic and all sorts of good stuff, and we could tell just by the smell that they were going to be delicious. And they were. I’m just not sure how well the two elements combined for my taste. 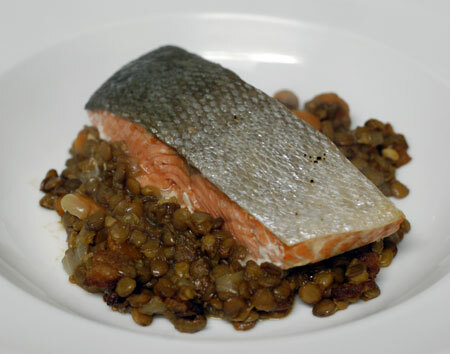 Every time I took a bite of lentils, I wished we were eating it with kielbasa or something instead of the salmon; and every time I ate a bite of salmon, I wished I had made some sort of rice or quinoa or pasta. The lentils were so savory that they made the salmon taste extra-fishy or something, and it just wasn’t working for me in combination. It wasn’t a failed meal by any means, however. The lentils really were delicious, and I’ll use that recipe again, just not with salmon. I’m very tempted to mix the leftovers together with some stock and tomatoes and have a little makeshift lentil soup for lunch. Add the lentils, broth, tomatoes, 1/2 teaspoon of the salt, the thyme, and bay leaf. Bring to a boil, reduce the heat, and simmer, covered, until the lentils are just tender, about 30 minutes. Discard the bay leaf and stir in the bacon bits and 1/8 teaspoon of the pepper. Meanwhile, heat the oven to 450°F. Sprinkle the salmon with the remaining 1/2 teaspoon salt and 1/8 teaspoon pepper, and rub with some of the reserved bacon grease. Place the fish, skinned-side up in a roasting pan, and roast in the oven until it flakes when pierced with a fork, or to desired doneness, 6-10 minutes depending on thickness. Put the lentils on plates and top with the salmon.